Is your building really green? Buildings are silent but deadly assassins of the earth’s atmosphere, compared with cars or power plants, accounting for nearly 40% of greenhouse gas emissions. So if you’ve just moved into a new “green home" in a high-rise complex, or your company is relocating to a Leadership in Energy and Environmental Design or LEED-rated office block, you may feel entitled to conclude, gleefully, that your carbon footprint is shrinking faster than Dubai World’s debt rating. You may well be wrong, according to a range of critics—including, ironically enough, the US Green Building Council, the inventor of LEED, which is the green building rating system. The council studied 121 newly constructed LEED-rated buildings in the US and discovered that although on average LEED-rated buildings were more energy-efficient than their conventional counterparts, 25% of the sample performed embarrassingly below the national average, undermining the rating system’s credentials. “Green (rated) buildings are not green enough and have further room for savings in energy consumption," says Nimish Patel, co-founder of Abhikram, an Ahmedabad-based architectural practice and one of LEED’s most articulate Indian sceptics. Instead, Patel advocates “merawala (my) green", a homespun philosophy that relies on traditional, inherently sustainable building techniques, with a good measure of what he describes as “common sense, innovation and a bottom-up design approach". Adding to the chorus of naysayers is GRIHA (Green Rating for Integrated Habitat Assessment), an Indian green building rating system, promoted by the Union ministry of new and renewable energy in 2008. Devised by TERI (The Energy and Resources Institute), it is one of nearly 25 national green building rating systems formulated by countries as diverse as South Africa and Singapore. “LEED has a multitude of flaws," says Manit Rastogi, managing director of Morphogenesis, a Delhi-based architectural practice and a member of the technical committee advising TERI on GRIHA. “Context is missing from LEED India and it is too homogenized, it does not drive innovation and diversity," adds Siva Kishan, chief executive officer of the GRIHA secretariat, an independent autonomous body registered by The Energy and Resources Institute (Teri). There is little dispute on the broad definitions. 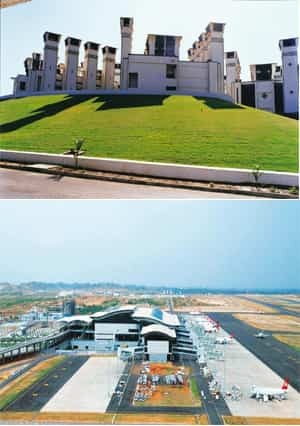 The Indian Green Building Council, or IGBC (part of the Confederation of Indian Industry, or CII), website states: “A green building is one which uses less water, optimizes energy efficiency, conserves natural resources, generates less waste and provides healthier spaces for occupants, as compared to a conventional building." Both LEED and GRIHA examine buildings on these parameters. The problems lie, as ever, in the fine print. LEED’s undue emphasis on materials and equipment and a lack of climate-sensitivity appear to be the rating system’s main drawbacks. For example, LEED-certified buildings must maintain indoor temperatures of 24 degrees (+/- 2 degrees) Celsius. In Gujarat and Rajasthan, year-round compliance with these standards would warrant air conditioning. Yet, both Morphogenesis and Abhikram have designed award-winning buildings in these regions, which maintain slightly higher temperatures without causing users to break into a sweat, through environmentally friendlier passive air-cooling techniques with minimal air conditioning. In the quintessentially Indian tradition of adapting-and-honing, GRIHA welds LEED’s systematic points-based structure with locally relevant principles. It is more prescriptive, with stern mandatory provisions that demand, for example, that 10% of the energy consumed comes from onsite renewable energy sources and that construction workers have access to clean drinking water. The emphasis on actual savings in operations and maintenance, rather than projections on paper (at the planning stage), are backed up by rating only once the building is occupied. But contextual appropriateness is not necessarily an assurance of universal acceptance. GRIHA’s tighter standards are likely to test the average project owners’ faith, possibly attracting fewer, if more committed, developers. The system is also just over a year old and untested, with approximately 45 projects seeking certification—a small fraction compared with LEED’s towering footprint of 436 registered projects in India, and 35,000 global projects. Since its inception in the US, LEED has travelled to 91 countries as both ambassador and currency of the green building movement. In India, CII spearheaded the cause by setting up IGBC in 2001 and releasing an Indian adaptation of LEED for new commercial and institutional buildings. “LEED is a scientific process which has delivered savings. All our buildings are certified by the IGBC. Our customers are MNCs (multinational companies), Fortune 500 companies who understand LEED," says Shabbir Kanchwala, vice-president, project coordination at K Raheja Corp., a Mumbai-based developer and one of the system’s earliest adopters. S. Srinivas, principal counsellor, IGBC, also says that “LEED’s principles are robust and easily adaptable to one’s own context. It is the mother of all ratings systems in the world." For green homes and industrial complexes, however, IGBC itself eschewed LEED in favour of its proprietary standards as it considered American homes and factories too different from their Indian counterparts. Dissenters such as Abhikram’s Patel believe rating systems inherently reward “intent rather than performance", possibly resulting in marketing propaganda rather than sustainable architecture. He narrates his firm’s experience of designing a research centre for pharma company Torrent Pharmaceuticals Ltd in 1997, which fully paid for itself in reduced power consumption over 13 years, without the guidance of any rating system. Patel’s work is laudable but to the more uninitiated majority, rating systems bring insight and discipline. Karan Grover, a Vadodara-based architect who designed India’s first platinum LEED building in 2003, admits that architects can get away with buildings that are “LEED in letter, but not green in spirit". He adds, however, that the system “is good because, for the first time, we are able to quantify (environmental impact) and integrate design" and plans to explore the concurrent application of LEED and GRIHA standards in future projects. With metal-and-glass office boxes dominating urban skylines globally, LEED’s ubiquity is assured. For GRIHA, the bigger challenge is likely to be its bureaucratic origins. It will be a shame if it is left to languish like the National Building Code 2005, another noble government effort which sets down health and safety regulations for construction country-wide, and which continues to be brazenly dismissed by real estate developers and occupiers, with the sanctioned plans being altered after certification and occupation, when no further checks are carried out. Its own targets are humble—5 million sq. ft of certified built-up area by 2012; a mere David as opposed to IGBC’s Goliath ambitions of 1 billion sq. ft. Equally, both sides concede that less than 5% of new buildings seek any green rating system, highlighting the growth opportunity. Unlike ongoing international diplomatic negotiations on climate change, perhaps this duopolistic rivalry will generate more light, less heat.